Aluminum and Stainless, Inc. has all the metal. 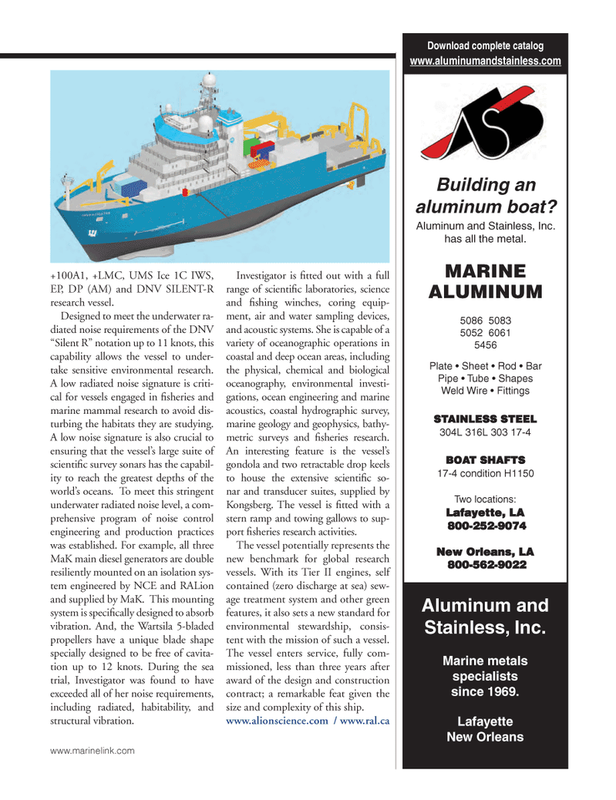 Marine metals specialists since 1969. EP, DP (AM) and DNV SILENT-R research vessel. Designed to meet the underwater ra- diated noise requirements of the DNV “Silent R” notation up to 11 knots, this capability allows the vessel to under- take sensitive environmental research. A low radiated noise signature is criti- cal for vessels engaged in fi sheries and marine mammal research to avoid dis- turbing the habitats they are studying. MaK main diesel generators are double resiliently mounted on an isolation sys- tem engineered by NCE and RALion and supplied by MaK. This mounting system is specifi cally designed to absorb vibration. And, the Wartsila 5-bladed propellers have a unique blade shape specially designed to be free of cavita- tion up to 12 knots. During the sea trial, Investigator was found to have exceeded all of her noise requirements, including radiated, habitability, and structural vibration. Investigator is fi tted out with a full range of scientifi c laboratories, science and fi shing winches, coring equip- ment, air and water sampling devices, and acoustic systems. She is capable of a variety of oceanographic operations in coastal and deep ocean areas, including the physical, chemical and biological oceanography, environmental investi- gations, ocean engineering and marine acoustics, coastal hydrographic survey, marine geology and geophysics, bathy- metric surveys and fi sheries research. Kongsberg. The vessel is fi tted with a stern ramp and towing gallows to sup- port fi sheries research activities. The vessel potentially represents the new benchmark for global research vessels. With its Tier II engines, self contained (zero discharge at sea) sew- age treatment system and other green features, it also sets a new standard for environmental stewardship, consis- tent with the mission of such a vessel.